CSI: Miami is an adventure-detective production that is directly based on a television series of the same title. This is the third edition of the CSI series - the previous two are CSI: Crime Scene Investigation and CSI: Crime Scene Investigation 2 - Dark Motives. 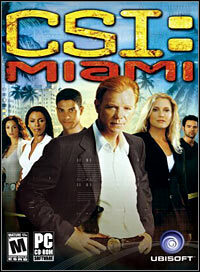 CSI: Miami is a detective adventure game based on a TV show known under the same title. This is the third installment in the CSI video game series released for PC, the other two being CSI: Crime Scene Investigation and CSI: Crime Scene Investigation 2 - Dark Motives. Obviously, the two are based on respective seasons of the TV show. The first episodes of CSI: Miami were aired in September 2002. The main difference between this game and the previous ones is the setting. Las Vegas, known from the first CSI, gave way to sunny Miami. The player also meets characters from the TV show, including Tim Speedle and Eric Delko. Just as in the case of the previous games, the player has to solve a series of criminal cases. While doing this, you can count on the help of the characters from the original CSI: Miami. However, the employees of the bureau do not interfere with your cases, limiting their influence to giving you useful hints or helping you out during interrogations. In the course of the game, you can make use of a wide array of specialized tools that can help you search in-game locations for evidence. Just as it was in the previous CSI games, sometimes you have to interrogate witnesses (several dialogue options to choose from) or solve simple puzzles (e.g. compare two pieces of material evidence or analyze DNA samples). The game employs first-person perspective, although you do not have full mobility as in other popular FPP titles. Instead, movement is grid-based with free camera rotation. Locations are pre-rendered, and just as in the TV series, progress in your current case is summed up in interesting cut-scenes that present the most probable case scenario, based on the knowledge gained so far. It is noteworthy that main characters were voiced by the actors that starred in the original CSI Miami. Game score 8.5 / 10 calculated out of 531 players' votes.